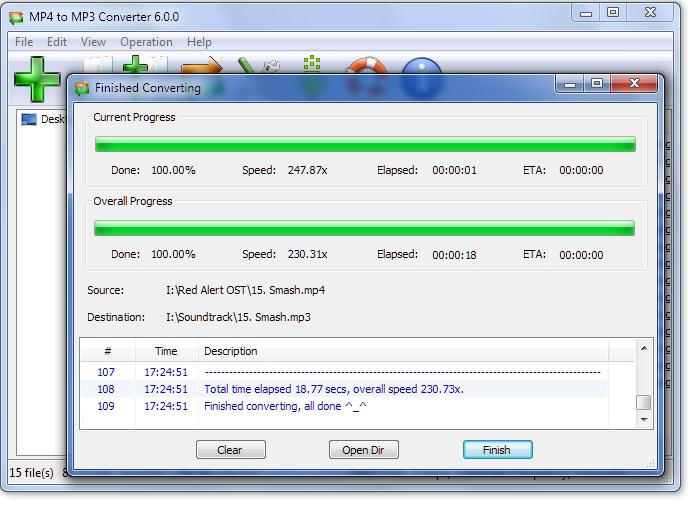 UDM Downloads > MP4 to MP3 Converter! MP4 to MP3 Converter is an easy, efficient, fast yet free MP4 to MP3 converter. It is capable of converting MP4 to MP3 easily and quickly. It can also extract audio stream from MP4 video files and save as MP3 format. It can copy & save audio tag from the source MP4 files to the destination MP3 files, MP4 to MP3 Converter is capable of writing ID3v1, ID3v2 and APE MP3 tag. It supports batch mode, MP4 to MP3 Converter can convert hundreds of MP4 files at once. It is incredibly fast, MP4 to MP3 Converter is the fastest MP4 to MP3 converter available. It is fully optimized for SSE/Hyper thread technology and you can get extra speed boost if you have multi-core CPU. MP4 to MP3 Converter supports on-the-fly converting, in other words, it does not generate temporary files during the conversion process. It is fairly intuitive to use with its Windows Explorer-Style user interface. It supports drag & drop. MP4 to MP3 Converter can effortlessly search, add and manage the MP4 files to be converted. It uses the latest MP4 codec and Lame MP3 encoder which is generally believed as the the best MP3 encoder. The last but not the least, MP4 to MP3 Converter is Windows Vista compatible and works with Windows 7 (64-bit and 32-bit).